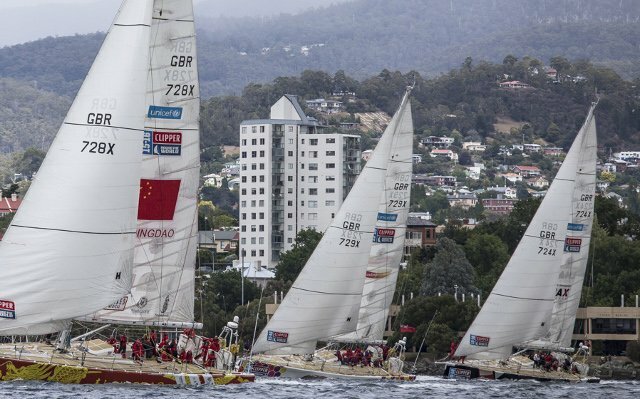 With Da Nang Viet Nam having secured a win in the Sydney-Hobart race, which doubled as race five in the Clipper Round the World Race, the fleet set out again Jan. 2. The Henri Lloyd Hobart to Whitsundays Race will take the fleet more than 1,600 nautical miles from the Tasmanian port to Abell Point Marina in Airlie Beach. At the starting gun, Qingdao was first to cross the line, followed by Derry~Londonderry~Doire in second and LMAX Exchange third. It was an upwind tack down the Derwent River towards Storm Bay. This leg of the global contest will ramp up as the fleet crosses the Bass Strait for the third time to race up the east coast. It is here that stamina, skill and courage will be put to the test as crews battle the force of huge ocean swells of the East Australian Current known all too well to Wendy Tuck, the Aussie Skipper of Da Nang Viet Nam. She admitted she was nervous, but ready to push the crew harder again following her Race 5 win. Later, Qingdao skipper Bob Beggs said he plans to fly the spinnaker once they clear the river. “We have a good breeze to get us going, then the wind will get a bit stronger as we get near Sydney,” he said in the release. Beggs said he anticipates a very tactical race, with lots of changes and lots of shallow water in the reefs so lots going on. “We are going to continue to put the team first. The team ethic is very strong. Although the last result didn’t show it, the team is working well together so we will be continuing that,” Bob added. While some may not resonate with this race, we can all agree the effort is an epic one, with crews crashing through hard seas and intimidating weather for every nautical mile. previous articleIs This A Dog Or Bear Cub?